Well, I love anything with cinnamon and toasting or baking with cinnamon & sugar is like having natural air freshener in the home. 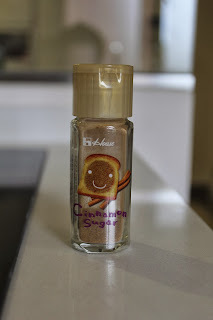 I bought this tiny bottle of cinnamon sugar in Daiso while in Japan. 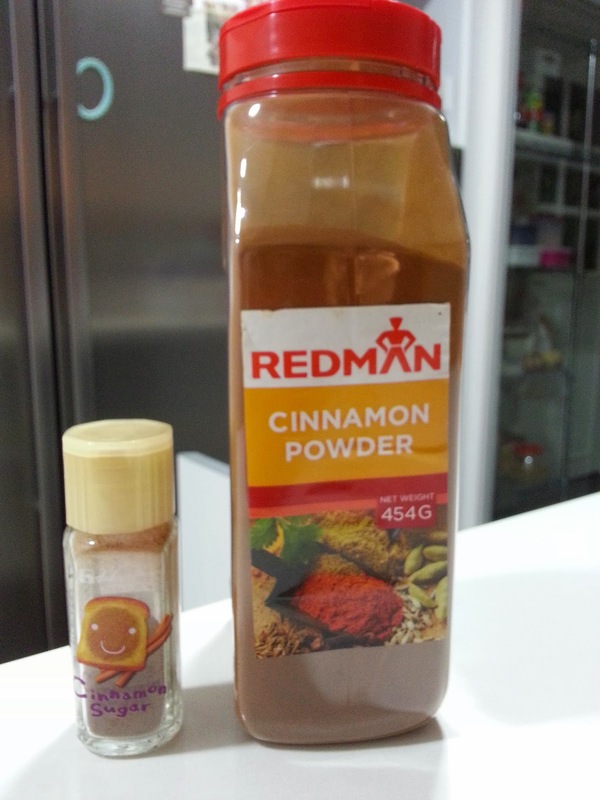 I have a HUGE gigantic bottle of plain cinnamon powder which I picked up at Phoon Huat as backup. I'm not even sure if I will be able to use it up but since the smaller bottle wasn't available when I wanted it, I had to settle for this giant of a supply. 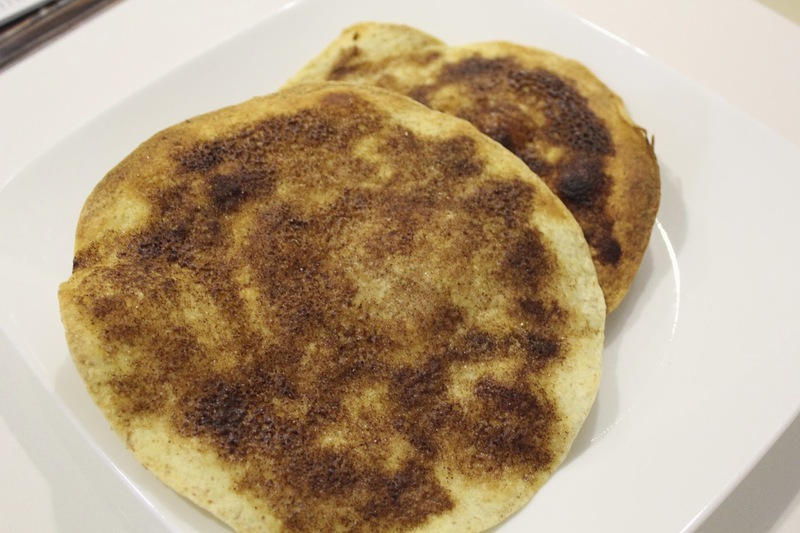 So, here are some easy to prepare snacks that Kiddo can help out with. Kiddo spread butter on the wrap and we went on to sprinkle cinnamon powder and sugar all over. Pop it into the oven and wait... not too long though, coz it will start turning black very quickly. So, stand next to the oven and watch over it (",) I'll say it will probably take 5 minutes or so. If you are using a toaster oven, it will be much faster. Kiddo flattened regular square shaped bread with a rolling pin and went on to spread butter on the flattened pieces. 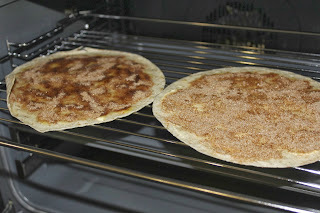 Next we added cinnamon and sugar and started rolling each slice into a log. Lastly, we cut the log up with a knife and that's that... oh yes, we did pop these 'sushi' pieces into the oven for about 5 minutes. I used to teach in an international school and there was cooking class every week. I tried this out with different spreads e.g. chocolate, peanut butter and jelly and butter with rainbow sprinklers and THE KIDS LOVE IT! 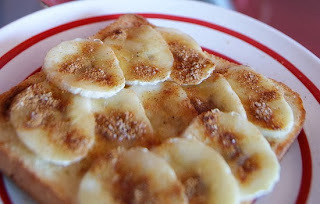 We sliced the bananas into thin pieces and layered them onto buttered bread. Sprinkled some cinnamon and sugar all over and toasted it (",) .... a warm and comforting snack indeed, but beware, it is pipping hot once out of the oven! Oh man... now I feel like baking me so cinnamon rolls!